A French loan word and often used in the context of wine, the term ‘terroir’ is the sort of word that, if you don’t know what it means, can seem a little pretentious and alienating. Especially when said in a bad French accent. But, in fact, whilst having a lot to do with wine, terroir is also important when considering bean to bar chocolate. ‘Terroir’ is loosely translated as ‘a sense of a place’. Essentially, it is the sum of the effects the local environment has on the production of the product. Characteristics such as the geography, geology and climate of a place all have an impact on the natural agricultural produce found in that area, and most of the time, it is produce such as wine, coffee, chocolate, hops, wheat and tea that are most effected. Everything – from the soil to the sky – can have a direct causal link to a product’s unique characteristics. Trees on Marou’s Cacao Farm. It’s fairly widely known that the origins of cocoa beans has a massive impact on the flavour of a finished chocolate bar. Bars from Madagascar beans, for example, are characteristically fruity whilst Ecuadorian bars are much more earthy. However it’s not just the country that the cocoa came from that can affect flavour. 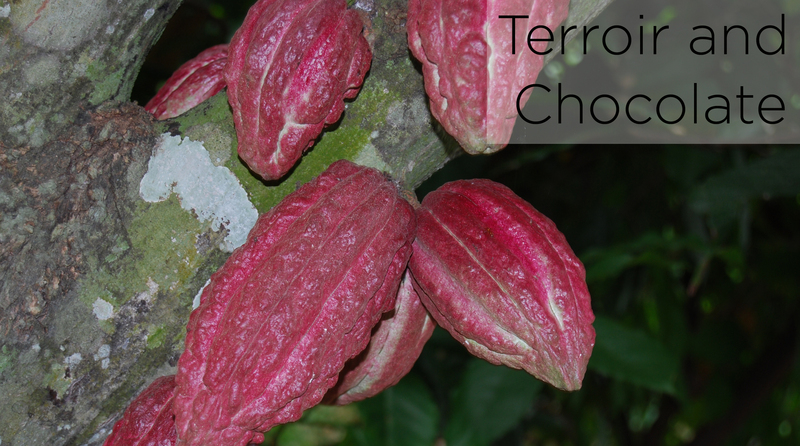 In much the same way that it affects the grape, the terroir of the cocoa plant plays a significant part in creating unique flavours. What emerges, then, is a dual – influence; region – the country of origin, and terroir – the conditions of growth. To this end Vincent and Samuel, the men behind Marou, have gone so far as to divide Vietnam in to separate regions, much like french wine growing regions. Each region produces vastly different tasting bars, even though they use the same beans and produce them in the same factory. 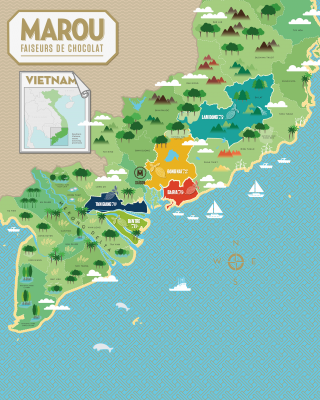 Marou’s map of Vietnam – Divided in to chocolate growing regions according to Terroir. Take Bertil Akesson. Some of his most unique bars contain pepper as inclusions; for example he makes 75% Madagascan bars from his Ambolikapiky plantation, containing either black, wild voatsiperifery or pink peppers. The synergy of tastes – the delicate sweetness of the chocolate and the tanginess of the pepper – works amazingly well in the bar and unsurprisingly too. Bertil actually grows his own peppers on a plot next to the cocoa plantation, using the pepper plant to shade the cocoa. Right from the root the the cocoa and peppers have been together, and the fantastic taste of his pepper inclusions bars is testimony to the cocoa’s unique terroir. Bertil on his farm in Madagascar. Danish chocolate maker Friis Holm has also been known to play with the terroir of their cocoa. The Chuno bar was made in two versions, where the only different between the bars was the number of times the cocoa beans were turned during the fermentation process. For what is seemingly such a small thing, the results are astounding. The two bars have noticeably different flavours, and serve to further underline the difference a bar’s terroir can make to it as a finished product. To celebrate these similarities we’ve partnered with Wine Chap Tom Harrow, Wine Director of Honest Grapes, and put together a selection of chocolate for wine lovers. Tom is wine director of Honest Grapes (@honestgrapes) and founder of WineChap (@winechapUK). He is by turns a wine writer, buyer, blogger, presenter, consultant and events & vineyard tour host. And we’re delighted to present his curated selection of bars for wine lovers.